The classic lawn ornament with a goulish twist! 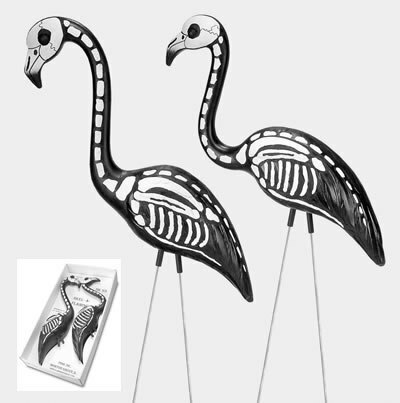 The skeleton flamingo makes a great decoration for your lawn or party. Summer is gone so let's bring in the Fall with the appropriate decor! Body is made of plastic with metal legs.Measures 22" (H). Price is for two skel o mingoes. For even a better deal consider buying the Party Pack and get extra goodies! If you want to buy more than 1 set of SkeloMingo's please contact us so we can give you a personalized shipping quote. Whenever possible we ship them via FedEx rather than the Post Office to save you on shipping. This is a bulky item. We will need you to provide us with your name and your zip code for a shipping quote. Please feel free to call us at 972 504 6666 or use the Contact Us button on the home page. SkeloMingos are a bulky item, so the more you buy the more you save on shipping.